It’s not everyday that you get to opportunity to sit down with Superwoman. I mean, she’s typically so busy flying around the world and saving it that she doesn’t really have time for chit-chat. But yesterday I was blessed with the opportunity to do just that. I got to talk to Superwoman, aka Candace Parker, and I it was pretty amazing. The two-time NCAA National Champion, 2008 WNBA Rookie of the Year, two-time WNBA MVP, 2008 AP Female Athlete of the Year and WNBA All-Star MVP (to name a few of her awards) balances family, basketball and life like no other. 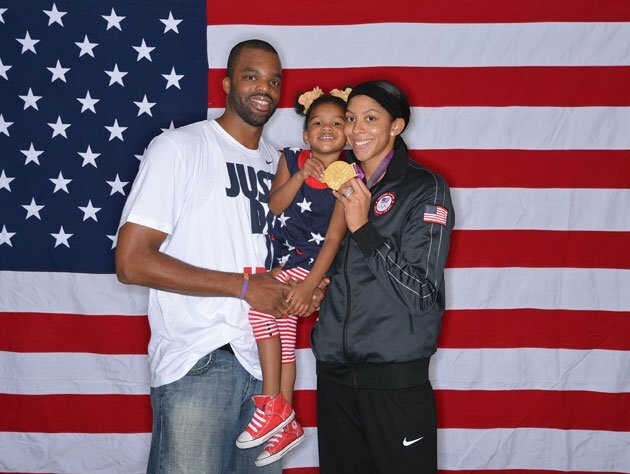 The LA Sparks star seems to move seamlessly between playing professional basketball from June to April for two professional teams, being a wife, volunteering her name and time for impactful causes and being a mother. And this is no new feat for her. As a member of the University of Tennessee’s Lady Vols squad she found balance between dunking basketballs and being an NCAA Division I Academic All-American, graduating with a 3.35 GPA with a degree in sports management. She is the Queen of finding time to do it all, a perfect role model for little girls and women who aren’t willing to sacrifice career for family. Find out how she manages to do it all and what she’s balancing these days. You have been managing life as an all-star athlete, a wife, a mother and a philanthropist for some time now. How have you been able to sustain such a demanding lifestyle for so long? It’s something that I always wanted. I’ve always dreamed of becoming a mom and being able to have a career and not sacrifice family as well. I have a great support team. My husband, Shelden Williams, is a phenomenal, phenomenal father. He really is great. He cooks, he cleans, he does everything. So being able to have him is great. My mom has also been a great help. She’s travelled with me a lot and made it a lot easier because I feel a bit more at ease with leaving my daughter with my mom. I just take everything in stride. There are different challenges that arise throughout the day. I’m required to wear different hats, but I just try to make it a point to be present and be good at what I’m doing at that moment. When I’m being a mom, I try to do that to the best of my ability and not worry about being an athlete. And when I’m on the court, it’s the same thing. In living your life this way, what message do you hope to present to your female fans/followers? The big word is balance. I hope that from my life they see that it’s important to have some sort of balance in your life in the things you do. Balance gives you more perspective. Sometimes people get so bogged down into what they’re doing and they don’t have other outlets. I think it’s important to be able to enjoy a lot of different things and to expose yourself to a lot of different things and not just be wrapped up into one thing. You seem to have mastered balance since your days as a Lady Vol. Do you have any advice for current student-athletes who are struggling to balance academics, athletics, friends, etc.? Well, if there’s something that I’m still trying to master myself it’s priorities. I feel that there are things in your life that you have to make a priority, and you do those things first. And if they can learn how to discipline themselves to do the important things first, everything else will fall into place. So my advice would be to manage priorities and to be disciplined. If you can learn the practice of self-discipline, so that nobody has to keep you on track, that’s the start to managing it all. It’s the biggest message that I’ve learned over the past 10 years. Speaking of student-athletes, you are one of the Ambassadors for the Capital One Cup. Every year Capital One awards a Cup and scholarship money to each of the best men’s and women’s Division I college athletics programs in the country. Can you tell our readers a little bit about how you feel about being a Capital One Cup Ambassador? It’s something that I’m obviously passionate about even though it wasn’t around when I was in college. I think that what Capital One is doing, giving $400,000 in student-athlete scholarships in a year for women and men, is really doing a lot for athletic programs. It gives bragging rights. It’s something for people to get excited about in college. You know, I was just at the Gatorade High School Athlete of the Year awards this past summer and Julie Foudy, who is a proud Stanford alumnus, was bragging about how her Stanford Cardinals had won. So I think it’s something for everybody to get excited about and to focus on. You know schools get points for winning national championships and it takes all sports into account so it’s all-encompassing. So what does being a Capital One Cup Ambassador require you to do? 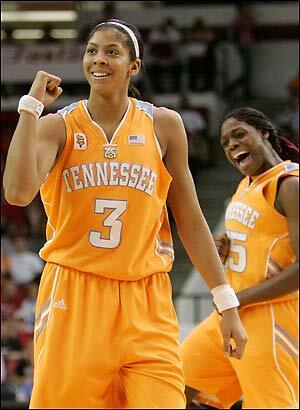 I really just spread the word, follow my Lady Vols and hope that they stay on top. I have to get the word out and make people aware of what Capital One is doing. Sounds like a pretty sweet gig. Other than Tennessee, do you have your eye on a particular school to take the cup this year? Well, I’m definitely partial because, you know, I’m a Vol. So I’m hoping that we can get some points winning national championships and so we can get in the top ten rankings. We’re not there yet. But if I’m looking at it from an unbiased point of view, it would be great for any SEC school to win it. So I guess I’d root for an SEC school. And then after that, my husband went to Duke, so I’d say I probably have to choose Duke. You were able to win two national championships with Coach Summitt and the Lady Vols, and that program has always had a rich history of winning, but this year it seems that the ladies are struggling to consistently play well. Beyond having a new coach, what do you think has changed with Tennessee’s program and what do you think needs to happen to get back to glory? I think that the Lady Vols are at a point of transition. Things that have happened to the program, for instance, Coach Summit being sick after having been there for 30 plus years, and Holly Warlick taking over. These are pretty major adjustments. I think they’re just in a period of transition, but I definitely look for them to be coming back to the Final Four. I think in this period of transition they’re going to have ups and downs. But they’ll be back. I think we’ll all be watching in anticipation for their comeback. Are there any players that you think our readers should keep their eyes out for? I think from the Lady Vols, Diamond DeShields is a great player who’s capable of becoming that go-to player that carries the load. She’s just got to lead her team. Obviously, Breanna Stewart from Connecticut is someone to watch. She’ll be in the WNBA this year so she’s definitely someone to pay attention to. I think overall all, from a talent standpoint, there are a lot of talented players that I look forward to coming into the WNBA and making it better. Speaking of up and coming female basketball players, why do you think it’s important for women/girls to be engaged in sports? I think it’s really important because I think participation in sports instills self confidence. It instills a team attitude and teaches girls how to work as a unit. Participation in sports also teaches you how to navigate different people. I think you learn from all your teammates. You learn what person is easy to work with and what person is more difficult, and I think you can take that skill (of navigating personality types) and become a better person. Participation in sports also teaches you to have a work ethic. It shows you that if you work hard at something you’ll get better results. I really want to encourage my daughter to play sports because I think it makes you an overall better person. GladiatHer™ is a term that combines gladiator and her. It means “Fiercely competitive woman who tackles her sport and the world on her own terms. She sacrifices blood, sweat, tears and time for the glory of victory and the love of the game, her teammates and her players. The GladiatHer™ is a strong, smart, dedicated woman who gives her all in the arena, on the field, in the gym, in the front office, in the news room and anywhere else that sports are found.” With that definition in mind, who is your favorite/most influential Gladiather™? My Coach Summit. Obviously, she is a Gladiather™. What she’s done to open doors for women’s sports, what she’s demanded from everybody across the board at the University of Tennessee, is amazing. I mean, she made college basketball what it is today. There will be no other Pat Summitt. Her work ethic is amazing. She doesn’t just talk about it. She isn’t the do-as-I-say type, she’s the do-as-she-does type. She walks the walk and that’s something that I am still learning to do from her. Even throughout her sickness and her trials, she’s never wavered. That’s why she’s my GladiatHer™. Though Candace might not refer to herself as being Superwoman, there really is no better way to describe a woman who does so many things and does them so well. The balance she is able to maintain in the face of a demanding career, a loving family who needs her and a community of people who look up to her is nothing short of heroic. She, Superwoman, Candace Parker, is a true inspiration for the many women who fight the same good fight day-in-and-day-out without a shred of the applause that she receives. Her life shows that all things are possible with faith in one’s self, discipline and balance. We’re so very grateful for the example that she sets. Follow Candace on Twitter and Instagram, and be sure to check out her website to stay up-to-date on where Superwoman is flying to next. To learn more about the Capital One Cup visit the website at capitalonecup.com. Share with us your thoughts on the interview and Candace. And don’t forget to follow GladiatHers on Twitterand Instagram, and like us on Facebook! This is awesome, awesome article and insight about a great athlete that the mainstream never hears about! Keep up the good work and articles coming!!! Nice work! Great read! It’s good to hear about females go getters and how they balance such a busy lifestyle. Thank you! Great interview! I loved the questions that you asked. It allowed me to learn things about CP that I didn’t previously know.